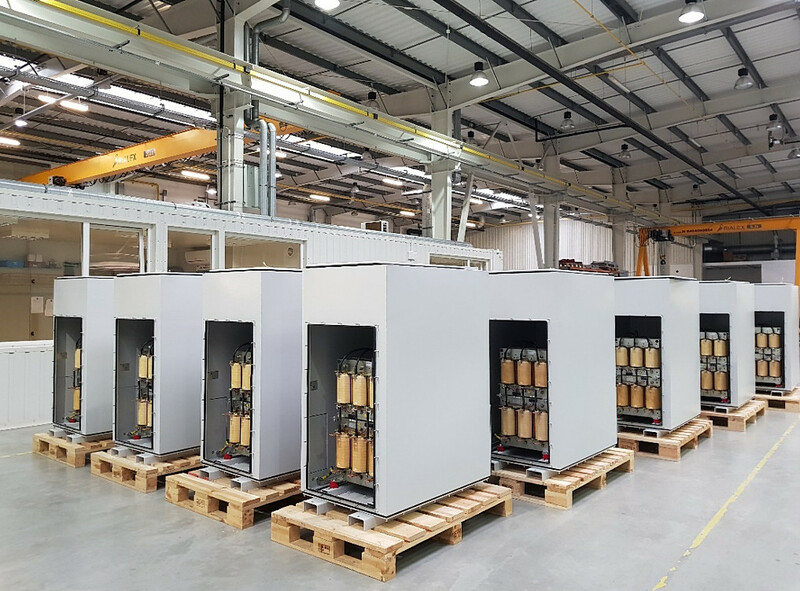 Elhand, a leading European electromagnetics manufacturer, has developed an advanced range series passive filters from 4kW to 2600kW for AC variable frequency drives (VFD’s), DC SCR drives and other rectifier applications based on their Core CutTM patented technology. Series passive filters are very popular for many drive applications due to their simplicity, ruggedness and excellent level of performance. Elhand’s range of harmonic and sinewave filter enclosures are amongst the largest in the world, covering IP00 to IP66 for operation in ambient temperatures to 55 deg C. Their filter products are fully adapted for all applications and working environments. Based in Lubliniec, southern Poland, Elhand Transformatory, is a high-quality (ISO 9001), innovative manufacturer of diverse electro-magnetic products including transformers, chokes and reactors; both standard types and special designs. 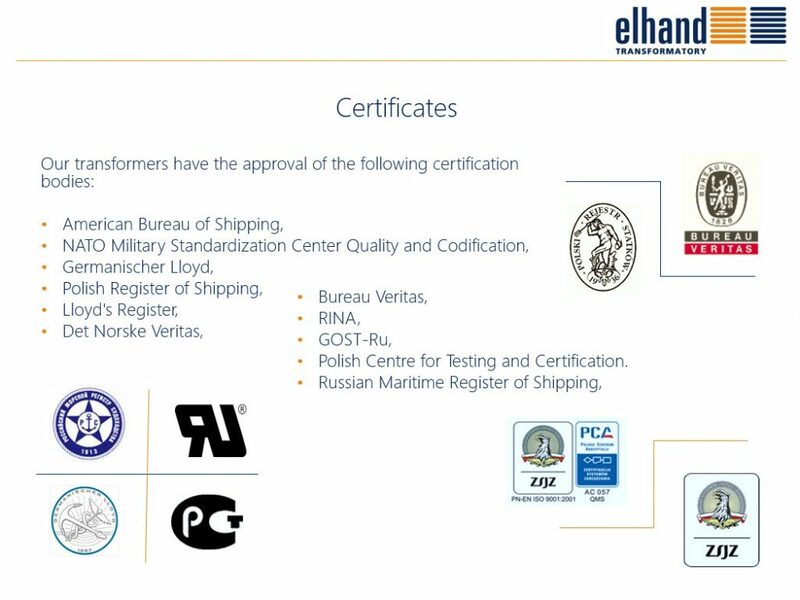 Through systematic and continual development Elhand have gained an enviable reputation as one of most dynamic magnetics manufacturers in Europe serving marine (including the US Navy and other NATO navies), offshore and industrial customers. As well as industrial customers, Elhand also supplies to the US Navy, NATO navies and other marine, offshore and industrial clients. 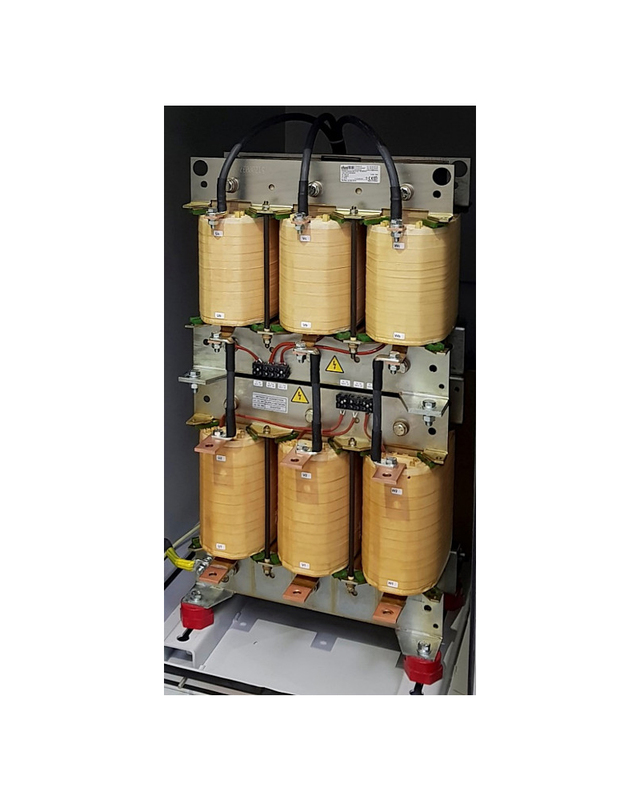 Elhand have developed an advanced range series passive filters for AC variable frequency drives, DC SCR drives and rectifier applications based on their Core CutTM patented technology (see below). Series passive filters are very popular for many applications due to their simplicity, ruggedness and excellent level of performance. In the design and manufacturer of series harmonic filters, the laminated magnetic core, around which the coils are wound is of crucial importance. The linearity of the filter’s magnetic characteristics is paramount. Any non-linearity can result in increased power losses (and associated temperature rise) and an increase in audible noise, especially in the areas adjacent in the air gaps. Elhand recognised this problem and as a result of an extensive research and development programme, introduced CutCoreTM multi-gap core technology for their harmonic filters and other products. In doing so, Elhand has eliminated or significantly attenuated, the technical problems regarding magnetic core. The cores manufactured by Elhand allows for a constant value of inductance irrespective of a wide range of changes in the filter current (magnetic linearity), reducing the audible noise level generated and eliminating the external magnetic field (see diagram). Consequently, the additional losses in the core, winding and structural elements are all reduced. The result is Elhand harmonic filters and other products are more efficient, have less power losses, lower operating temperatures and reduced audible noise compared to competitors. 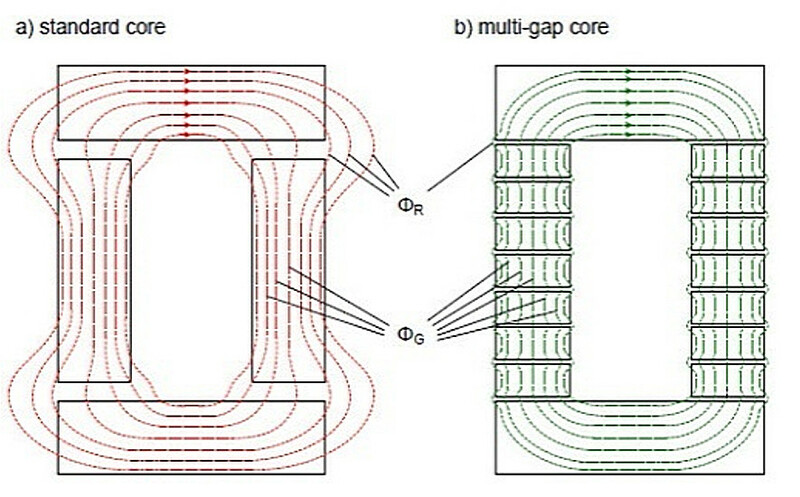 For technical paper “Harmonics Filter as Guarantee of Electromagnetic Compatibility and High Efficiency of Converter Drive Systems” click here. * Note that the Ithd level shown with the EF3H filter connected above is 5.47%. This test was conducted in March 2015. The design has subsequently been improved and performance of <5% Ithd at rated load is the norm. 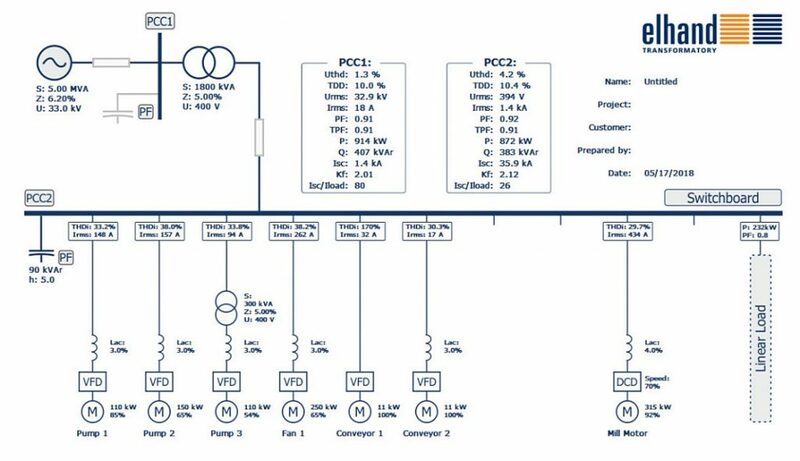 The standard range is 4kW/5HP to 2600kW/3500HP in voltages from 380V to 690V, 50Hz or 60Hz, in enclosures IP00, IP20, IP23, IP54 and IP66 and ambient temperatures to 55 deg C. General specification is shown. Note : Also see Elhand Drive Systems Industry catalogue. 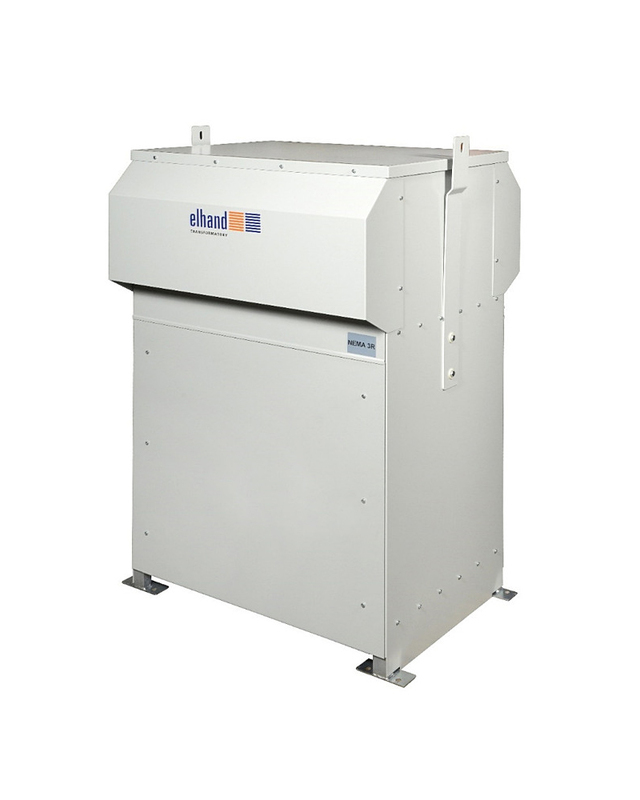 Elhand EF3H harmonic filters are highly efficient with performance levels of <5% Ithd. Another important feature is the capacitive current at no-load being <15%. This ensures capacitor bank connection is not required at no or light loads. Elhand have recently introduced the innovative EF3H three phase harmonic filter design for the hanging vertical position. This is ideal for retrofits (can be mounted on the wall) and for electrical panel builders as it can be installed inside a panel or switchboard thus saving valuable floor space. Range is from 4kW/5HP to 110kW/150HP in IP00 and IP20 formats. Higher IP ratings available on request. For dimensions of EF3H IP21 harmonic filters please click here. 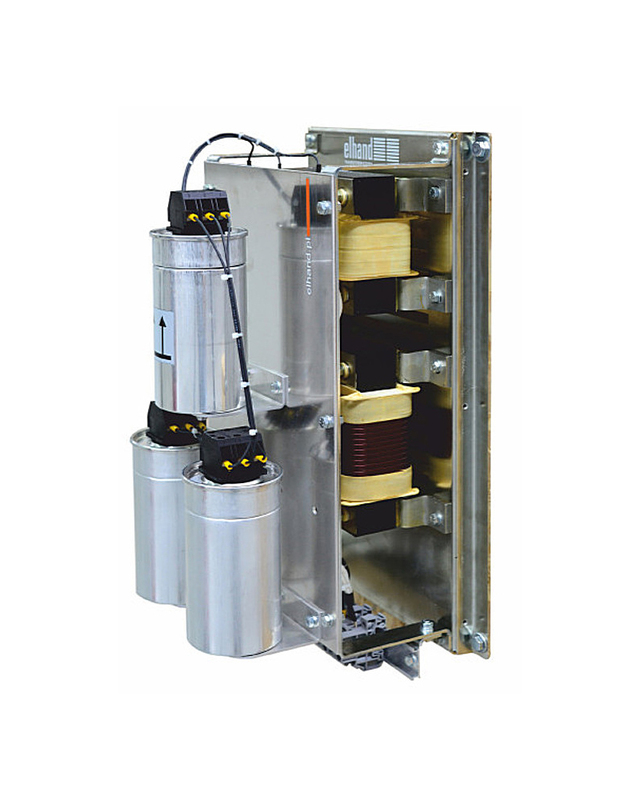 For applications above 132kW, wall mounting series harmonic filters are not available. 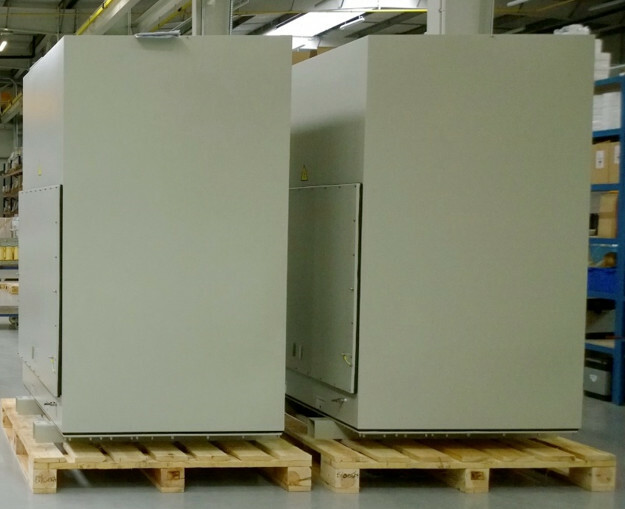 Traditional floor mounted versions are therefore offered in powers to 2600kW/3500HP for AC VFD, DC SCR drive and other rectifier applications. Specification as per advised with <5% Ithd performance, 15% capacitive current at no load and operation up to 55 deg C. The range of enclosure options from IP00 to IP66. Special marine and offshore rated designs are available, encompassing thermal reactor monitoring, capacitor protection and if required, PQ (power quality) monitoring can be provided. Marine deck proof enclosures to IP66 also available. Series passive harmonic filters are extremely popular for oilfield ESP (electrical submersible pump) applications; in desert oilfields, offshore or installed on FPSOs. They are renowned for their simple design, effective performance, ruggedness, both electrically and environmentally, lack of complex maintenance and ability to operate in high ambient temperatures (to 55 deg C). Elhand has supplied ESP companies since 2012, mainly in the Arabian Gulf. Many hundreds of Elhand harmonic filters (and output sinewave filters) are successfully operating in the region. 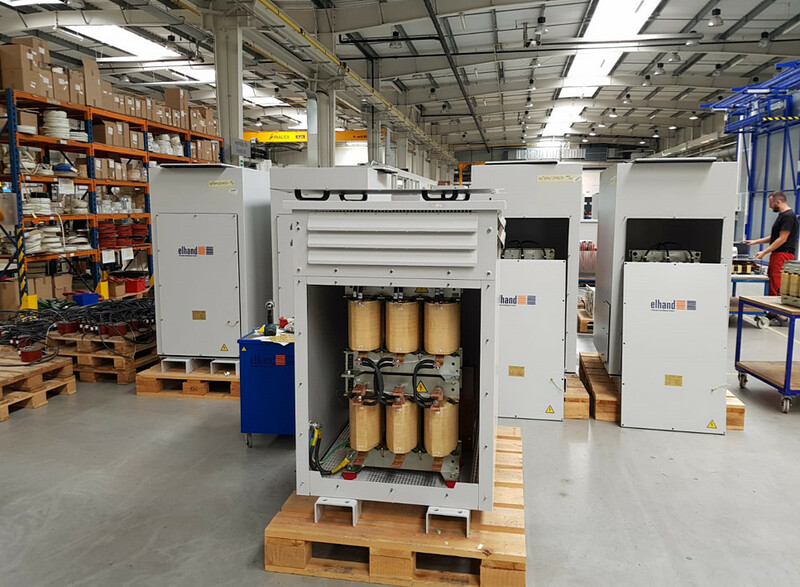 15 off 600kVA, IP54, 55 deg C Elhand EF3H harmonic filters for ESP oilfield application in Saudi Arabia (desertified design). 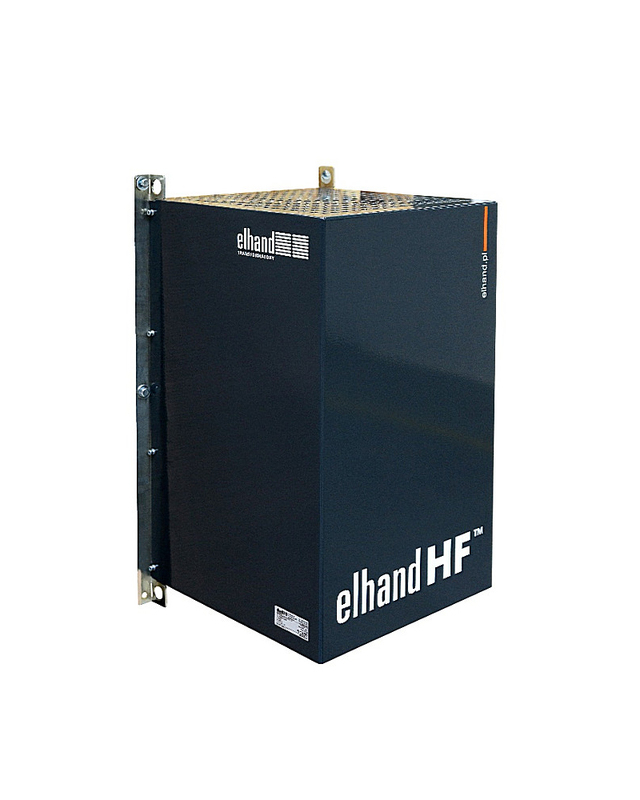 Note : Elhand also manufactures du/dt and sinewave output filters for ESPs and other VFD applications in the range 4kW to 2600kW to match VFD kVA ratings. For more information click here. For all your ESP harmonic filters (and sinewave filters) enquiries and applications please contact us. Elhand has a large number of harmonic filter enclosure options (IP00 to IP66), this combined with two hundred and eighty (280) harmonic filter variants spread over seven voltage/frequency ranges, means It is not feasible or possible to detail all the dimensions and nett weight information on this website. Harmonic filter enclosure options available from IP00 to IP66. 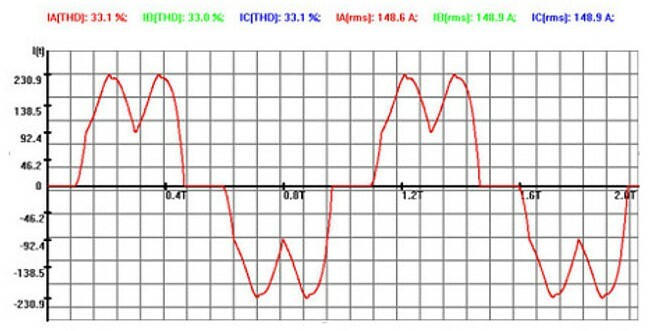 For information on dimensions of any harmonic or sinus filters please contact us. Over the next few months Elhand harmonic estimation software will the available to model drive applications using up to ten (10) nodes for AC and DC drives AND programmable current sources. The full range of Elhand harmonic filters can also be selected for harmonic mitigation simulation. The programme automatically selects the appropriate Elhand series filter from the designated database. The harmonic voltage and currents are modelled to the 50th order (for standards compliance) and also up to 100th order. The Urms and Irms waveforms and associated spectra is available for each node. This software will be free of charge once customer registration has been completed. Comprehensive reports in pdf form will be downloadable including compliance or otherwise with IEEE 519 (1992), IEEE 519 (2014) and other standards. For information on SineTamerTM for oilfield ESP VFDs click here. 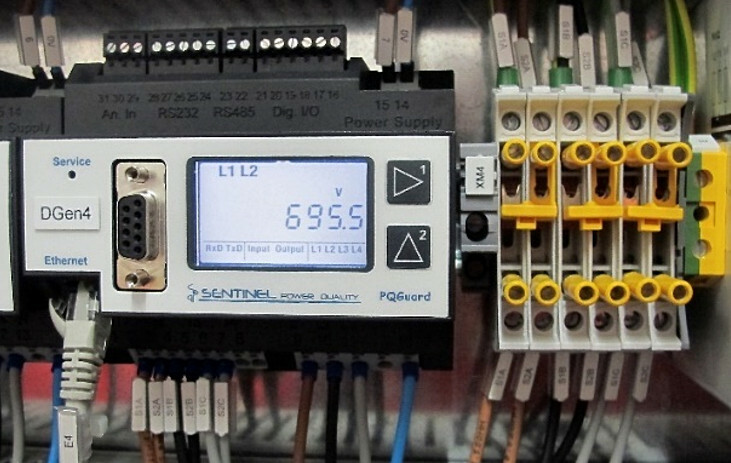 An increasing number of clients require power and/or power quality monitoring from each ESP, either via manual download or remote monitoring. These are ideal applications for PQGuard. Click here for more information on PQGuard.